My original reaction was to crack a joke about how an air pollution event of this type could not happen post-Brexit when all borders would be taken back into UK control. And then it became clear that what happened had led to serious health effects with more than 150 people treated in the local hospital. The beach self-evacuated in about 10 minutes with most suffering from stinging eyes and sore throats and some from nausea. Fortunately, the cloud dispersed over a few hours and the beach welcomed many people back for the next day, Bank Holiday Monday. Several of the eye-witnesses on the beach mentioned the smell of chlorine, RNLI staff in the boats sent to investigate mentioned a smell of burning plastic. Then locals remembered an incident in 2013 when mercaptans (the chemical added to natural gas to make it smell so that we know it’s there) were released in an incident in the Lubrizol industrial plant, Rouen, which is about 200 miles to the south. Could they have done it again? But this time with chlorine-containing chemicals like vinyl chloride, used in the manufacture of PVC. Had there been a fire? That would explain the smell of burning plastic. No such reports were made and the winds had been light and in the wrong direction. So the “chlorine” from France explanation began to seem unlikely. Unless there had been a massive PVC fire on a ship or ships passing by in the English Channel. And that certainly had not happened. More theories were put forward. For example, an ammonia-releasing algal bloom that had floated close to Birling Gap or exhaust emissions from ships or terrorism or chem/contrails or even a World War I container resurfacing with leaking chemical agents. My original thought (when a French chlorine gas release origin was suspected) was that a bleach-containing aerosol was to blame……more about that idea later. The normal questioning procedure for investigating a scientific problem then got into gear: (i) what are the actual observations/measurements of relevant air pollutants like ozone in the area? (ii) what were the wind speeds and directions? (iii) what information could satellite imagery provide? (iv) what past precedents are there to explain the phenomenon? I will start with the precedents. The first is the classic Sherlock Holmes “peasouper” experienced in London in the 19th century culminating in the 1952 Great Smog (smoke+fog) that led to the UK Clean Air Act in 1956. Essentially they were all due to burning smoky coal to produce a yellowish, sulphurous haze. That species of killer is now, fortunately and finally, on its way out from our 21st century fuel mix. The reason its emissions are so toxic is because of the black sooty particles that come off directly from burning any domestic solid fuel and also its high sulfur content. Sulfur is a “sticky” chemical that encourages particles/droplets to grow around it after it has been oxidised in the air to sulfuric acid and sulfates. Acid rain then falls. The very large quantities of coal burnt in London really caused the peasoupers especially when combined with low winds and most importantly with a weather phenomenon called a temperature inversion. More about that soon. Londoners experienced all of the typical, adverse health effects associated with a particulate/droplet: respiratory problems, stinging eyes and, in thousands of cases during/after the 1952 smog, death. In 1943, Los Angeles residents believed that the Japanese were attacking them by chemical warfare. A thick fog descended that made people’s eyes sting and their noses to run. It turned out not to be terrorism at all, instead it was found to be due to the rapidly increasing car market related to wartime immigration in LA, lots of sunlight and the local topography. Road transport based on diesel and petrol fuel lead to the production of air pollutants like carbon particles, hydrocarbons and nitrogen oxides. These are bad enough for our health but the location of LA in a so-called Basin surrounded by mountains on three sides, sitting next to the cool surface of the Ocean with the air heated on top by the continual sunshine does not help. The conditions lead to the local weather effect likened to a saucepan with a lid on: a temperature inversion. When you have one of those there is little escape for any pollutants trapped in the saucepan. The saucepan is, of course, see-through, and so sunlight can cause many photochemical reactions to occur if the pollutants, emitted by the cars, absorb light. In a short time-frame the primary pollutants are joined by many toxic nasties like ozone, formaldehyde and many hundreds more. 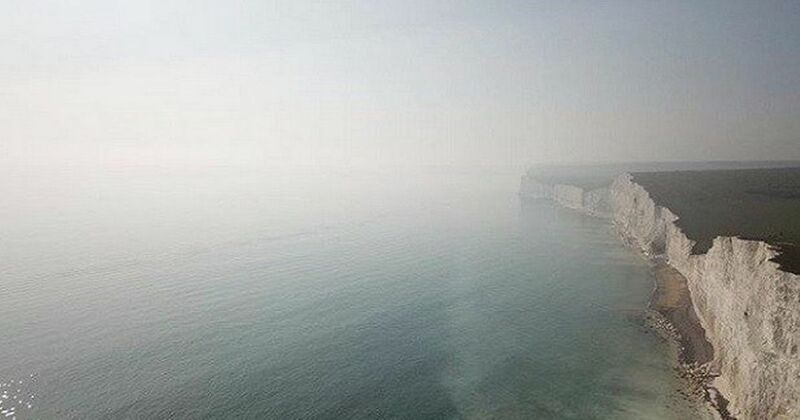 Precedents then do exist to explain the Beachy Head smog, although neither involve chlorine. Back to the observations and measurements. The striking picture of the mist rolling in to Birling Gap beach became an instant classic and will be used in many Atmospheric Chemistry lectures in future I can tell you. The photographs of people getting away from the beach with blood-shot eyes and coughing will also remain with us. So from the precedents the question was asked: is it a London-type or an LA-type or a mixture of both or something completely different? To answer that question needs sophisticated instrumentation. Fortunately, the UK has a high-quality air monitoring network and several ozone monitors are sited quite close to the place at which the incident occurred. For example, a large spike in concentration (exceeding EU legislated limits) was observed between 16.00 and 16.30 in Eastbourne, about 5 miles away. However it is of note that the instruments, which depend upon the measurements of how much light ozone absorbs at a particular wavelength, can be subject to error in the presence of very large quantities of interfering species like hypochlorous acid (bleach) and benzene-like compounds. Such conditions do not normally arise and ozone reported to us from day to day can be fully relied on. Highly sophisticated meteorological trajectory models confirmed that the event did not originate from France, although potential sources from either the very busy English Channel or inland along the UK coast could not be ruled out. So if the Daily Star wanted to blame the French then maybe they could blame La Manche. Oceanographers then joined the debate saying that algal blooms producing sulfur compounds or ammonia could lead to the events on a warm day with low winds as it had been at Beachy Head that day. But the majority of attention turned to shipping releases especially when a satellite image showed a perfect plume trail (although with no visible ship) at the time just before the event. That picture is dramatic and may represent an air release directly from a ship or from a disturbed algal bloom. The obvious candidate for the plume is the burning of “dirty”, bunker fuel by ships. It contains much sulfur of peasouper fame. At least it used to be so. In fact, the shipping industry has cleaned up its act considerably over the last two years, especially for sulfur, because it has been pressed by the IMO SECA rules. Acid rain forming emissions and particles are still released though, especially the ubiquitous NOx. All of the above has been said before. There’s nothing new just a summary. But here’s an idea to consider, shoot down or see if it is right over the coming months. What about shipping ballast, grey water, bilge and sewage? Ballast tanks are used in ships to provide stability. It is redistributed in a flow. It moves in and it moves out. It has long been known that ballast discharges can have serious impact on the marine environment because they contain a variety of biological materials. Hence a variety of disinfection technologies are now available for cleaning the ballast water (and sewage) before discharge. Chemical disinfection is realised by adding oxidising compounds like chlorine or related. Newer systems generate hypochlorite ions by electrolysing sea-water. Here is my “what if” then. What if lots of ballasting/sewage discharge was happening on the Sunday afternoon and a disinfection system or systems were acting faulty? And releasing the disinfectant. One product could be the important atmospheric chemistry intermediate, HOCl (hypochlorous acid). In the temperature inversion saucepan that was present at Beachy Head that day because of the sunshine and low winds, the material may have built up by the bleach reacting with the acid rain ingredients. Then an offshore breeze could have blown the gas/aerosol cloud to the beach. The products from the mix would be complex because sunlight breaks HOCl into two reactive chemicals very quickly, the hydroxyl radical and the chlorine atom. They can both attack hydrocarbons making quite smelly compounds (as often sensed when plastic burns). The chlorine atoms can also lead to a very rapid acceleration of ozone release in the lower atmosphere. It also has a similar absorption spectrum to ozone. It would all quickly dissipate. But it, like ozone, could give people the symptoms experienced. As Sherlock Holmes so memorably said: “Once you eliminate the impossible, whatever remains, no matter how improbable, must be the truth”. Let’s wait and see.